Sam is trying to disguise his plaids as stripes. This shirt looks grey indoors, but seems more blue in daylight. It has a very bold vertical stripe pattern, but is an extremely subtle plaid. It is a Western cut that does up with snaps – which is Sam’s usual preference for shirts. It has two breast pockets that have the plaid going diagonal on them, and also do up with snaps. Wardrobe has (at least) two copies of this shirt with slightly different patterns, though fundamentally they are the same shirt. In Two Minutes to Midnight (5x21), Sam wears it from the beginning of the episode, until after they get Pestilence's ring. He changes into a different shirt after Crowley shows up and gives them Death’s location. In All Dogs Go To Heaven (6x08), Sam wears this shirt when he stakes out the house that Lucky lives in. He keeps it on until after they shoot all the Skinwalkers (version#2). In The French Mistake (6x15), Sam wears this shirt for the entire episode. 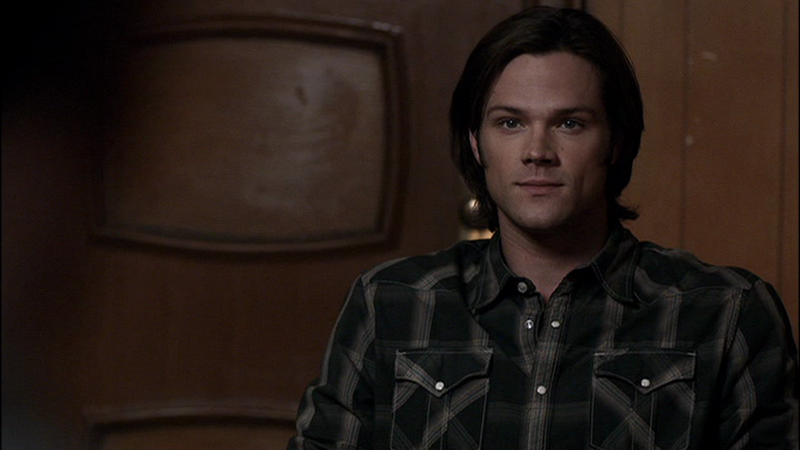 In The Girl Next Door (7x03), Sam wears this shirt when he is at Rufus’s cabin. In Slash Fiction (7x06), Sam is wearing this shirt when he arrives at Frank’s. When we see him leaving, he is in a different shirt. In Heartache (8x03), Sam wears this shirt after they interview Eleanor Holmes the first time. He leaves it on while he and Dean solve the mystery that is Brick Holmes, but changes out of it before they go back to talk to Eleanor the next day. 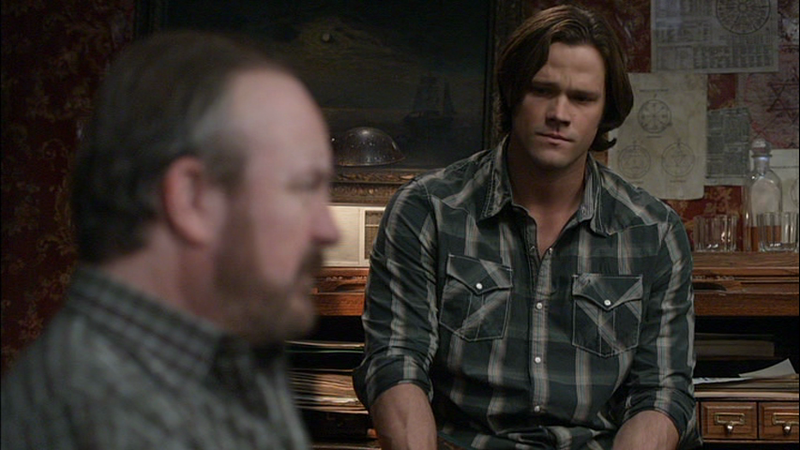 In Torn and Frayed (8x10), Sam wears this shirt for almost the entire episode, only changing for the final two scenes when Dean and Sam talk about Cas in Rufus’ cabin and then watch TV. Sam also isn’t wearing it when we see him in bed after having slept with Amelia – instead, Amelia is wearing the shirt. In Citizen Fang (8x09), Sam wears this shirt for the entire episode, except for flashbacks (of course).